Compiled by Russell Hamilton. 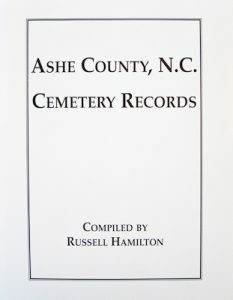 This is a two-volume set, with information gathered by visiting all the known grave sites in Ashe County and recording the gravestone data. The information is presented by family name listed alphabetically. It also includes cemetery information, additional information from obituaries, relatives and friends of the deceased. A reference to cemetery listings in the back of Volume 2 includes detailed informations on how to find the locations. Offered as a set, Volume 1 is 520 pages, Volume 2 is 518 pages. On Sale! Was-$68, now only $44.99 for both.